Whether you're looking for instant enhancements for your photos or you're willing to put in a little more effort, On1 Effects has you covered. Every decent quality image editor draws comparisons with Photoshop, but On1 Effects could be one of the few that stacks up very well, and it's free of charge. That's not to say that this is a Photoshop copy – far from it. In fact, when you fire up the program, you would be forgiven for thinking On1 Effects is a very basic automated image tweaker; it is very long way from that. Working as either a standalone program, or as a plugin for Photoshop or Lightroom. 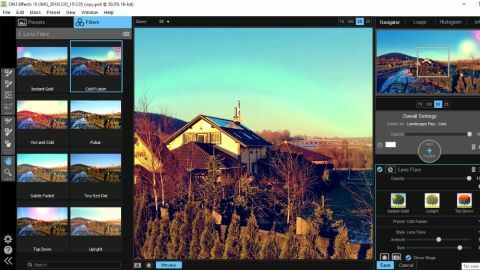 While on the face of things On1 Effects looks like a point and click photo editing solution, it's actually more hands-on that it first appears. Yes, there are endless effects that can be added for a quick fix, but there's also scope for using masks and layers, blending modes and more. The workflow is a little different to software you may have used before, but it's easy enough to get to grips with. If you're an amateur photographer looking to take things to the next level, or even a pro who has been turned off by the complexity of Photoshop, this could be the tool you have been waiting for. It's worth remembering that this is a piece of software that used to sell for US$60 (about £45, AU$80) – and now you can have it for free. Things get off to a great start from the moment you drag and drop an image into the program – an unusual approach for Windows software, but one that's standard to Mac users. You're given the opportunity to edit images directly, or to work on a copy non-destructively, which is a nice touch. The interface is pleadingly different to most other image editors, with an unusual but highly useable layout, and a dark theme that's gentle on the eye. The numerous presets and filters with which you can enhance your images are all neatly organised into a navigation bar, and little previews give you an idea of what to expect without even having to click. You're free to use these individually or layer them up to create unique results, and there's also scope for customising individual effects. Results are impressive and easily achieved, though performance can be a little slow.